Got the recipe from here and just modified it some. 1) Marinate the beef in 3 tbsp olive oil, garlic, paprika and pepper overnight. Feel free to poke the beef pieces with a fork so that the garlic oil will be better absorbed. 2) Heat a pan and 1 tbsp olive oil till very hot. 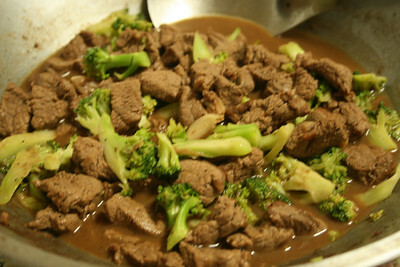 3) Saute marinated beef in the pan without lowering heat. 4) Keep stirring beef until browned evenly. 5) Add the oyster sauce and liquid seasoning. Feel free to add more pepper too, if you like. Keep stirring. 6) A minute before removing from heat, add the broccoli florets. 7) Remove from heat and add the butter and stir till the butter melts. Serve hot.